From a member of the elite force, an inside look at the brutal training and secret work of the commandos who got Osama bin Laden. At Camp Pendleton in California, where I did my initial weapons training, we must have fired thousands of rounds at practice-range targets printed with the likeness of Osama bin Laden. 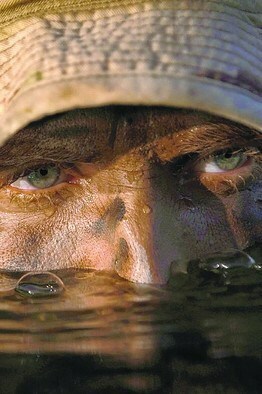 To take the real shot, the one that brought down bin Laden, was the dream of every Navy SEAL. The man who got that chance in Pakistan last weekend was a member of the SEAL community’s most elite unit. He and the others who descended on bin Laden’s lair would have put in relentless practice for weeks beforehand—assaulting mock compounds, discussing contingencies and planning every detail of the operation. Most of the men on that mission had dedicated the past decade of their lives to this fight, and they—and their families—had made great personal sacrifices. Turning on my cellphone last Sunday, I got a text message with the incredible news: “OBL is dead. Hoo Yah!” Within minutes, a tidal wave of messages followed from fellow Navy SEALs and other military and nonmilitary friends. My own thoughts went back to James Suh and Matt Axelson (“Axe”), two members of my own SEAL training class. When Axe was pinned down by the Taliban in a firefight in Afghanistan in June 2005, Suh boarded a helicopter to fly in for a rescue mission. The helicopter was shot down that day and both men died. I thought to myself: Axe, Suh, they got him. 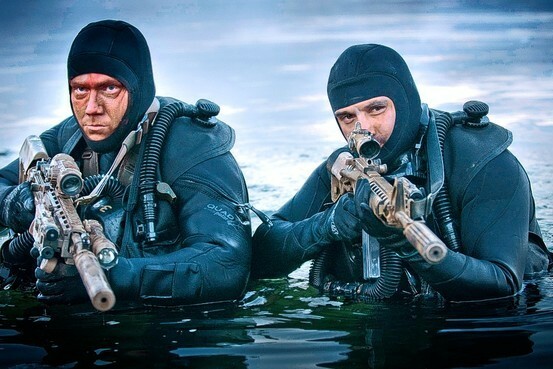 The men who conducted the assault on bin Laden’s compound are part of a proud tradition of service that traces its roots back to the Underwater Demolition Teams that cleared the beaches at Normandy. The SEAL teams themselves were born on Jan. 1, 1962, when President John F. Kennedy commissioned a new force of elite commandos that could operate from the sea, air and land (hence the acronym, SEALs). Though SEALs remain the nation’s elite maritime special operations force, part of what Kennedy wanted and needed from them—and what the nation still asks of SEALs—is that they be a flexible force, capable of operating in any environment. 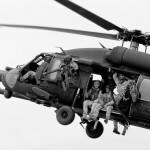 It’s impossible to account for everything that can go wrong on an operation, but professional warriors aim to leave nothing to chance—the slightest details are accounted for beforehand, from who will be the first to “fast rope” down from the helicopter to how the compound will be swept for computers and papers that might yield intelligence. Targets vary, but the objective of the planning is always the same: accomplish the mission and bring everyone home alive. 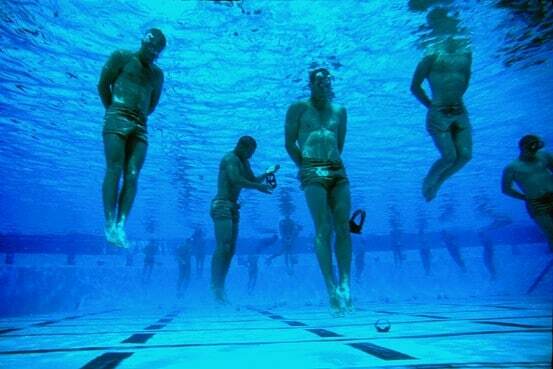 The rigors that SEALs go through begin on the day they walk into Basic Underwater Demolition/SEAL training in Coronado, Calif., universally recognized as the hardest military training in the world. BUD/S lasts a grueling six months. The classes include large contingents of high-school and college track and football stars, national-champion swimmers, and top-ranked wrestlers and boxers, but only 10% to 20% of the men who begin BUD/S usually manage to finish. About 250 graduate from training every year. Though often physical in nature, the tests of SEAL training are also designed to push men to their mental and emotional limits. “Drown-proofing” is one of the most famous of these ordeals. I remember it well from my own training in 2001. Standing with five other men next to the ledge of the combat training tank, I put my hands behind my back while my swim buddy tied them together. He tugged at the knot to check it a final time. A knot that came undone meant automatic failure. The five of us exchanged glances and then, with our hands and feet firmly bound, jumped into the pool for a 50-meter swim. SEAL candidates are also tested with two-mile ocean swims, four-mile timed runs in soft sand, and runs through the mountains wearing 40-pound rucksacks. The pinnacle of SEAL training is known as Hell Week, a period of continuous tests and drills during which most classes sleep only a total of two to five hours. Every man has a different story of Hell Week; he remembers particular classmates and instructors, his own most difficult moments. But every Hell Week story is also the same: A man enters a new world aiming to become something greater, and having subjected himself to the hardest tests of his life, he has either passed or failed. My Hell Week began in the middle of the night. Sleeping in a large tent with my men, I woke to the sound of a Mark-43 Squad Automatic Weapon. The Mark-43 has a cyclic rate of fire of 550 rounds per minute. It is the primary “heavy” gun carried by SEALs on patrol. A blank round is not nearly as loud as a live one, but when the gun is rocking just feet away from your ears in an enclosed tent, it still sounds painfully loud. Out of the corner of my eye, I saw men running for the bell. First two men ran, and then two more, and then another. The instructors had carried the bell out with us to the beach. To quit, you rang the bell three times. I could hear it: Ding, ding, ding. Ding, ding, ding. Ding, ding, ding. A pack of men quit together. Weeks earlier, we had started our indoctrination phase with over 220 students. Only 21 originals from Class 237 would ultimately graduate. I believe that we had more men quit at that moment than at any other time in all of BUD/S training. What kind of man makes it through Hell Week? That’s hard to say. But I do know—generally—who won’t make it. There are a dozen types that fail: the weight-lifting meatheads who think that the size of their biceps is an indication of their strength, the kids covered in tattoos announcing to the world how tough they are, the preening leaders who don’t want to get dirty, and the look-at-me former athletes who have always been told they are stars but have never have been pushed beyond the envelope of their talent to the core of their character. In short, those who fail are the ones who focus on show. The vicious beauty of Hell Week is that you either survive or fail, you endure or you quit, you do—or you do not. Some men who seemed impossibly weak at the beginning of SEAL training—men who puked on runs and had trouble with pull-ups—made it. Some men who were skinny and short and whose teeth chattered just looking at the ocean also made it. Some men who were visibly afraid, sometimes to the point of shaking, made it too. Almost all the men who survived possessed one common quality. Even in great pain, faced with the test of their lives, they had the ability to step outside of their own pain, put aside their own fear and ask: How can I help the guy next to me? They had more than the “fist” of courage and physical strength. They also had a heart large enough to think about others, to dedicate themselves to a higher purpose. SEALs are capable of great violence, but that’s not what makes them truly special. Given two weeks of training and a bunch of rifles, any reasonably fit group of 16 athletes (the size of a SEAL platoon) can be trained to do harm. 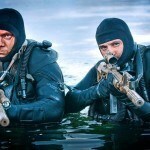 What distinguishes SEALs is that they can be thoughtful, disciplined and proportional in the use of force. Years later, in early 2007, serving in Fallujah as the commander of a unit targeting al Qaeda’s operations in Iraq, my SEAL training served me well. In combat outposts throughout Fallujah, what had once been medium-sized houses were now ringed with sandbags, earthen barriers and barbed wire. Groups of Marines, Iraqi soldiers and intelligence professionals from the military and other government agencies gathered there to plan and launch operations. Though the specific tactics, techniques and procedures used for these operations remain classified, I can say that the fusion of operations and intelligence was a key development, allowing commandos to act swiftly on new information. When raids were conducted and men returned with computers or financial records, or even sometimes with the terrorists’ pocket litter and scrawled notes, the intelligence professionals would set to work immediately. Often, by the time the commandos woke up, they had a new set of targets to hit the following night. I remember sitting with Marines who had (cautiously) shared small pieces of intelligence with our Iraqi counterparts, who had (cautiously) shared information with us. Slowly, piece fit into piece, and like a family sitting down to snap together a jigsaw puzzle at Christmas, a picture emerged of the habits and acquaintances of an al Qaeda sniper who was suspected of being responsible for the death of several Marines in Fallujah. The target wasn’t a senior man in the al Qaeda hierarchy. In fact, he seemed to be a runt, but sometimes the men who seemed like runts ended up having surprising connections to other terrorists. Over time, our picture of the al Qaeda network grew more complete. More and more terrorists were revealed, and the targets became so numerous that other forces had to be recruited to take them down. I had once imagined—probably based on watching bad movies about cops battling the mafia—that somewhere we would find a hierarchical chart of al Qaeda with bin Laden sitting at the top and pictures of men like this sniper near the bottom of a pyramid. In fact, no such clear picture existed, and every piece of new information seemed to offer a different way of interpreting what we thought we knew. But throughout Iraq, night after night, we launched raids from the air, over land and yes—given the country’s rivers—even sometimes from the water. Over time, the constant pressure degraded and destroyed al Qaeda’s ability to operate. The terrorists knew that if they stayed in one place for long, they might be surprised in their sleep and find themselves being handcuffed by “men with green faces,” as they sometimes called our commandos, whose faces, backlit by their night-vision goggles, seemed to glow green with menace in the middle of the night. 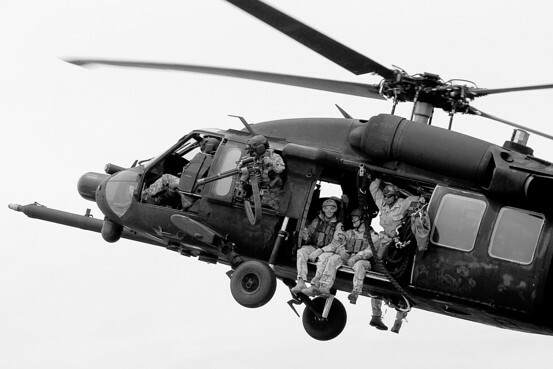 Members of al Qaeda in Iraq came to expect that they might wake up one night to the whomp of a helicopter overhead, the rattle of a Humvee outside, the explosion of their front door. These were the rude sounds of justice tracking them down, and Osama bin Laden no doubt heard them as well.